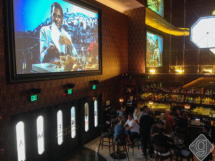 We enjoyed being part of the A/V installation at Sinema Restaurant & Bar, Nashville. Multiple projectors and flat screen tv’s combined with multi-zone audio and Elan control helps make Sinema the 5 star establishment it is today. Management can easily control audio and video via iPad app throughout the entire restaurant. Auralex acoustical treatment provides an extra level of absorption to the first floor restaurant. Our staff has already enjoyed several incredible meals at Sinema from Chef Dale Levitski. See more at www.sinemanashville.com.